In 2007, El Centro Hispano de Todos los Santos had moved into our first storefront. As December approached, we began to plan how we would celebrate Christmas. Already, a good part of our congregation was from México and Guatemala. 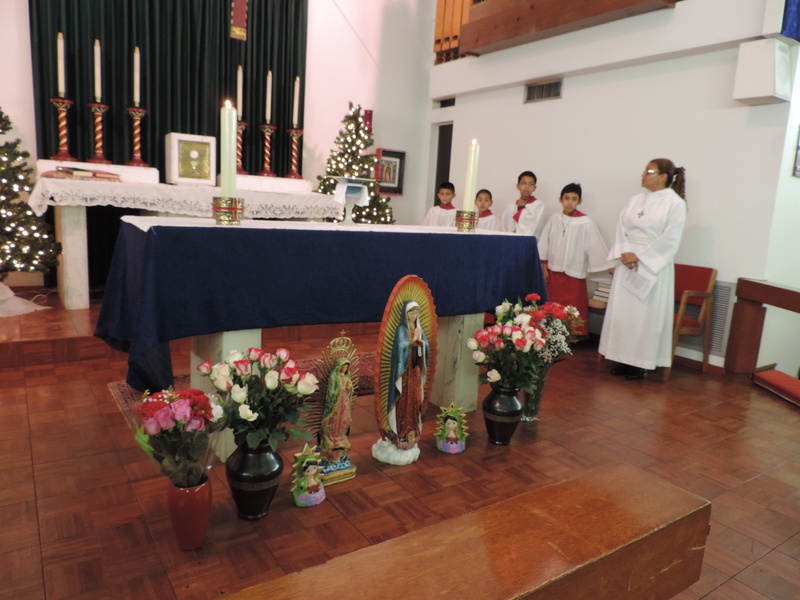 There was no way not to stop to celebrate the feast of “La Guadalupana”. We hired us some Mariachis. In a tiny plot of dirt in the middle of concrete we planted plastic roses and we made a banner of Guadalupe. We processed down Davie Blvd for a block and half while people looked on quite confused–a woman priest, deliciously sweet acolytes, Mariachis. 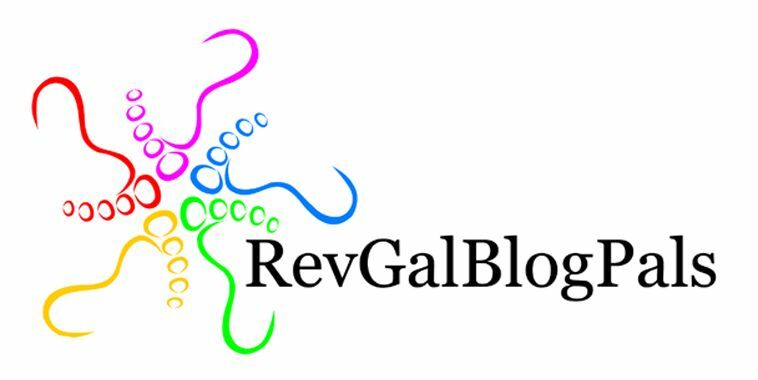 Then, we placed the banner in the middle of that beautiful dollar store garden of roses; we sang and prayed for a while longer and rejoiced at what we were discovering about who we were. Last night found us at St Ambrose with 75 people–children, babies, members of All Saints and St Ambrose and El Centro. Again, we processed, and celebrated and had wonderful tamales and hot chocolate like they’re prepared in México. We are still our ragged, lovely, faithful and struggling selves. 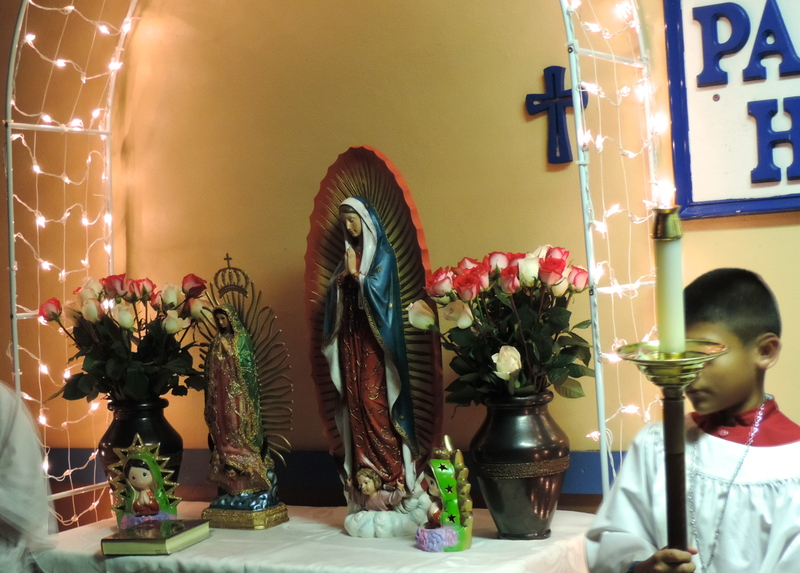 The loveliest moment of the evening came when just about everyone was in the parish hall, feasting on tamales and hot chocolate the women of El Centro had prepared earlier in the day. I was doing a few last things in the sacristy. Unlike other years, we did not hire a group of Mariachis to play for the serenade. Instead, two young men, relatives of one of our parishioners, came to play the music of this feast day. 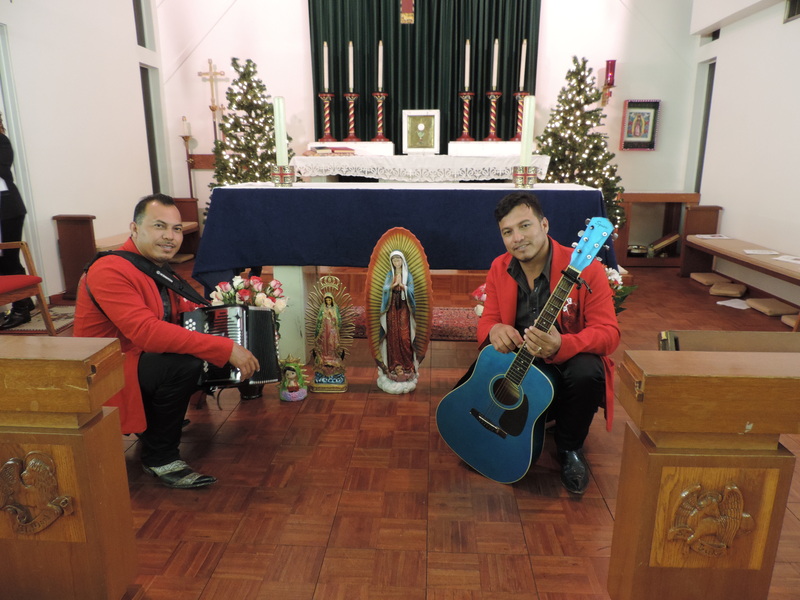 Now, the two stood in front of the altar at St Ambrose, almost alone, singing their hearts out, continuing their serenade to the Guadalupana. I haven’t quite figured out why I was so moved. Maybe it was the simplicity. Maybe it was because after all the words have been said and all the rites observed, there is something essential about song as our expression of faith. Their harmony was not sophisticated but it was earnest and careful. They were not singing for an audience, they were singing from the heart. In the quiet of a busy evening in December, I stood for a little while and allowed myself to listen with gratitude to the voices of angels singing in the sanctuary of the little church I have been so blessed to pastor. my favorite feast day, particularly here in LA where it is Virgen-day all year round . I have been particularly interested in exploring her pre-Conquest incarnations. Looks like a jolly time. and have actually discovered too mmy expsnse that many of the pid ones are essentially useless. public domain and functions remarkably well. If you’ve any type of interest in accelerating your discovering after that why not take a look?